Ron Paul believes in pretty much every discredited, crackpot conspiracy theory you’ve ever heard of. In other words, Paul believes that two significant moments of greatness in American history were carried out improperly. 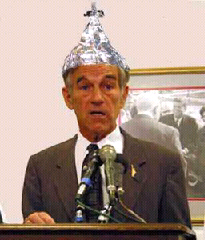 And he loves his tinfoil hat.